Black caimans found in South America are the fourth largest extant member of the crocodile family. These robust reptiles were almost hunted to extinction for their hide, but conservation efforts over the past few decades have ensured that their population is now safe and thriving. There is an estimated population of 25,000 to 50,000 individuals in the wild. 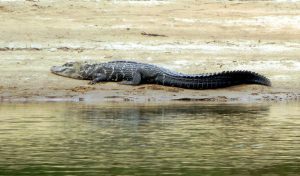 Size: Adults measure around 9.2-14 ft (2.8-4.26 m). Weight: Some old male individuals can weigh as much as 880 lb (400 kg). Color: True to their name, these reptiles have a dark to almost black body color. There is a grey to brown band on the lower jaw. Juveniles have a more varied coloration with a white to yellow band on their sides that they retain for some time even after reaching adulthood. 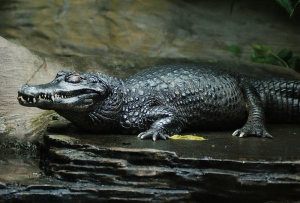 Black caimans occur in Brazil, Bolivia, Colombia, Peru, Ecuador, Guyana, and Venezuela. 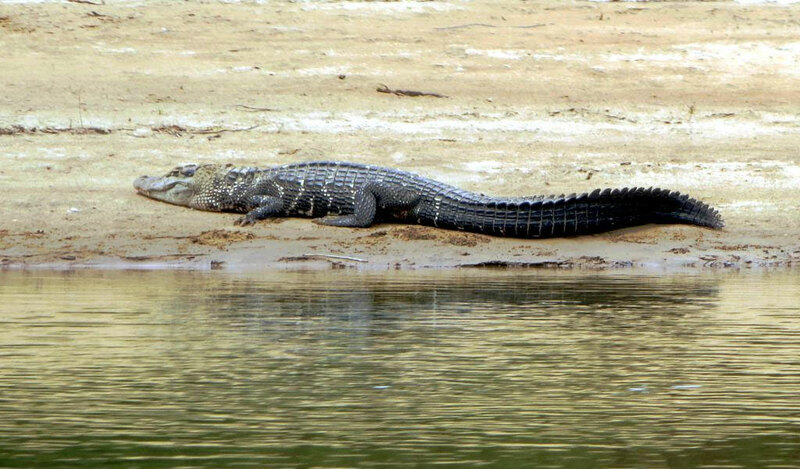 French Guiana is host to the most number of these reptiles. They inhabit freshwater habitats like slow-moving rivers, streams, lakes, flooded savannas, and wetlands. Having a nocturnal lifestyle, they hunt at night. Their population is dispersed during the wet season due to floods in the Amazon, but become more densely packed around the dry season in the vicinity of permanent rivers and lakes. 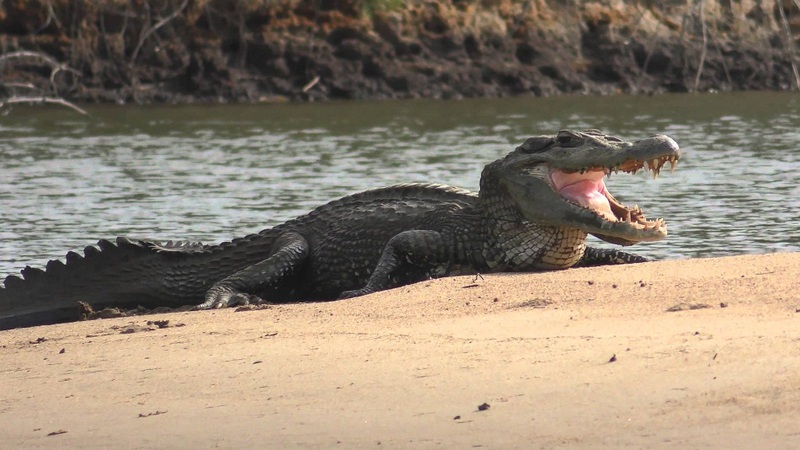 Black caimans are the apex predator in their habitat. 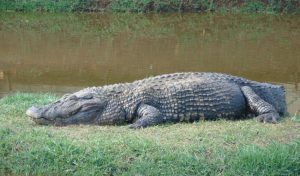 They are capable of taking any animal within their range, although their diet usually consists of fishes like piranha, perch, and catfish. They may also feed on turtles, birds, and mammals like deer and capybara. Larger individuals can also take down tapirs and anacondas. They swallow their prey whole as their teeth do not allow them to rip off flesh. In case of larger prey, they let the flesh rot for a few days before biting off chunks from it. They breed during the dry season. Females construct a nest mound with a chamber for the eggs. Clutches typically comprise between 30 and 60 eggs but can have up to 65. They hatch after around two to three months. Females help the hatchlings to emerge from their eggs by gently cracking them open with her teeth. Although independent by nature, the hatchlings are looked after by the mother. Very few survive to adulthood. 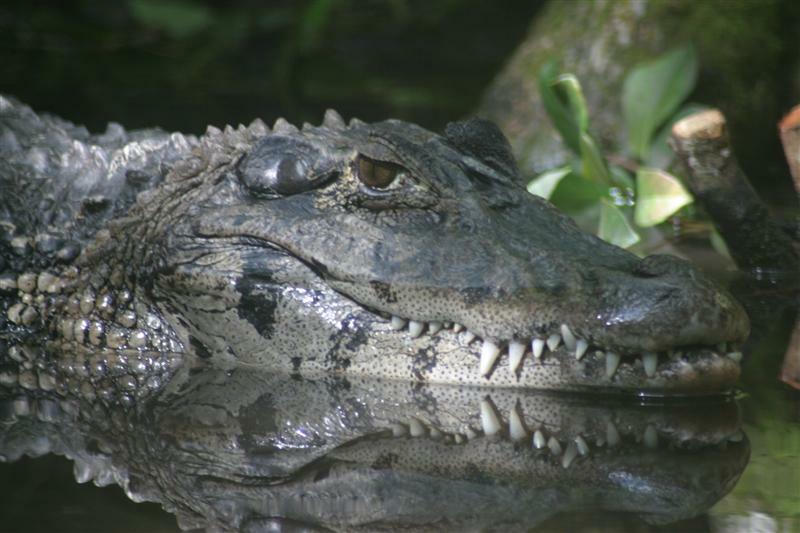 Like other caimans, they reach sexual maturity between the ages of four and ten years. 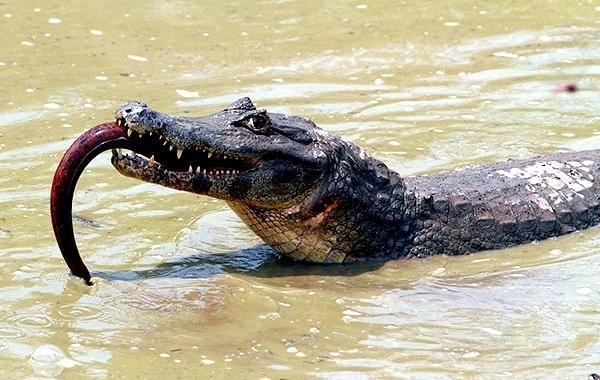 Black caimans have a lifespan of 50 to 80 years. They make a noise that resembles rumbling thunder. Hatchlings chirp from inside the egg to let their mother know they are ready to emerge. The color of the skin coupled with their habit of hunting at night helps them stay camouflaged. It also aids in absorbing heat. The large eyes help them see clearly in the dark. They have an exceptional sense of hearing and use it to locate their prey while hunting. The big head aids in taking down large prey. They have enough jaw strength to ensure that they crack open turtle shells with their bite force. Eggs and hatchlings become vulnerable to predators when the mother goes off to hunt. Birds like vultures and herons, snakes, and mammals like the South American coatis and jaguars are known predators of eggs and juveniles. 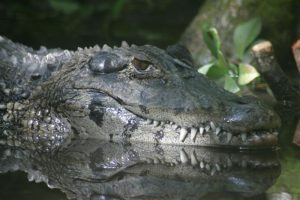 Adult black caimans do not have any natural predators. 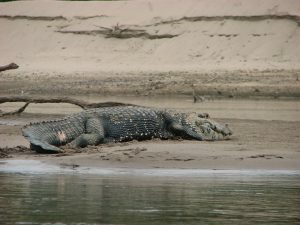 The IUCN lists the black caiman under their ‘Least Concern’ category. 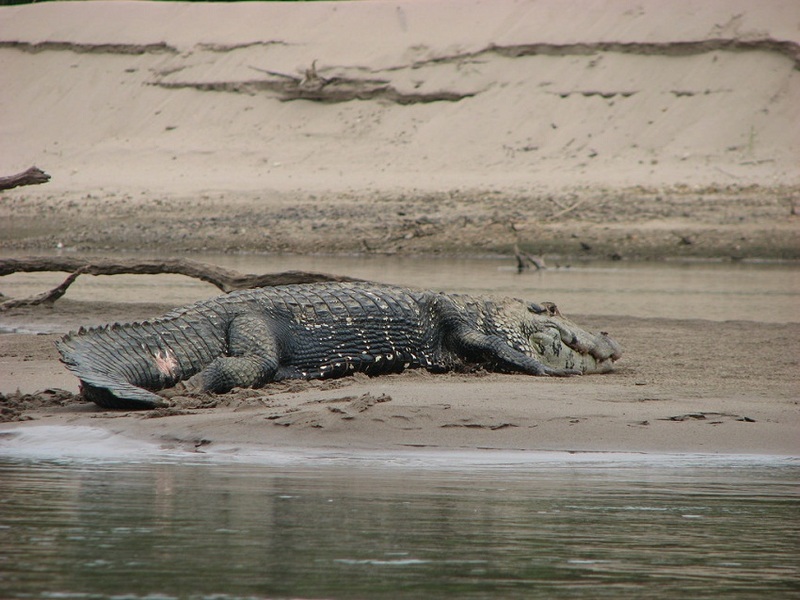 Black caimans are considered a keystone species as they play a significant part in the maintenance of the ecosystem. They are a recently studied species, having been researched on only since the 1980s. There have been old males recorded to have measured more than 16 ft (5 m) in length.